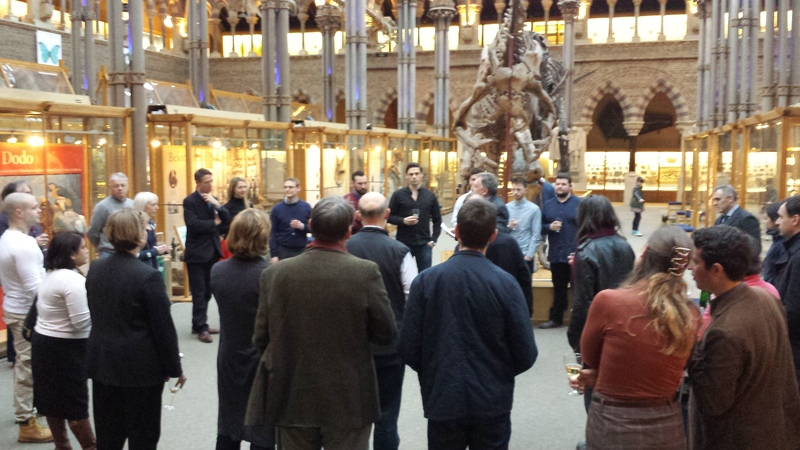 On Friday we had drinks in the court of the Museum of Natural History to celebrate the launch of free public Wi-Fi across all four of the Oxford University Museums. An informal event, the drinks were simply an opportunity to thank everyone who worked on the project, both officially, and the myriad people who contributed unofficially in the form of very last minute favours! This significant and necessary new service was only made possible by generous funding from Oxford City Council through the Super Connected Oxford programme. Oxford has been lucky enough to be awarded funding from DCMS to upgrade both wired and wireless infrastructure in the city as part of the national super connected programme. 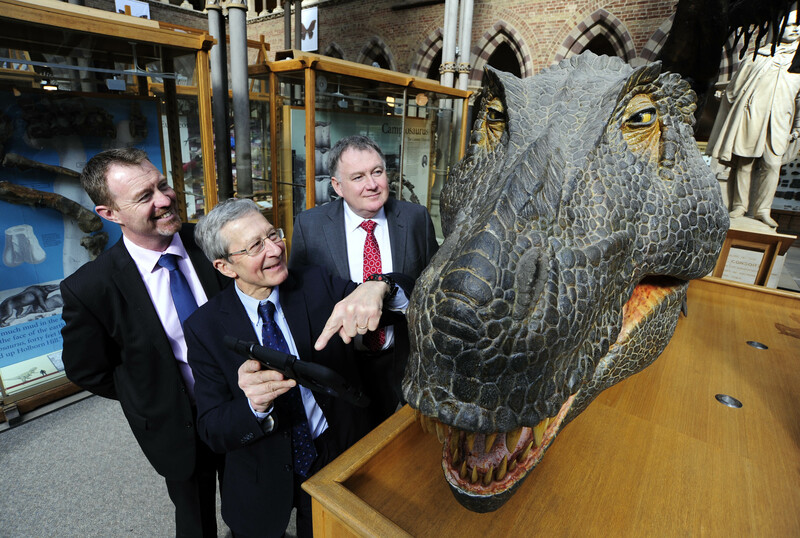 Some of this funding was earmarked to enable free public Wi-Fi in buildings freely open to the public, specifically including museums and galleries, and additional funds were also provided by the Oxfordshire Local Enterprise Partnership to enable this activity. As is often the case with government funding, there were strict deadlines for both spending the money and getting the work done. We signed our contract in September 2014 and had until the end of March 2015 to deliver! This may seem like a lot of time, but the project included installing over 100 new access points in the public spaces in our four Grade I listed building – this meant that the work was time consuming and costly, with each point being a bespoke fit, and that each also required approval from Conservation. But thankfully with the support of two fantastic electrical contractors – Monard Electrical and Darke and Taylor – plus the support of the university Estates department and building services colleagues in each of our buildings, we were able to pull this off, actually finishing ahead of schedule. The project also included upgrading our wired infrastructure to manage the additional expected traffic, procuring s separate backhaul to keep traffic separate from university traffic and provide the required bandwidth, and securing a Wi-Fi company to provide the kind of service we wanted. After a significant tender process we went with WiFiSpark as they could offer a reliable and bespoke service. Once you join the Wi-Fi network at any one museum, it remembers you and you do not have to re-register at any of our other sites – though you will be pushed through the portal to our mobile website to show you the most relevant content we have on offer. 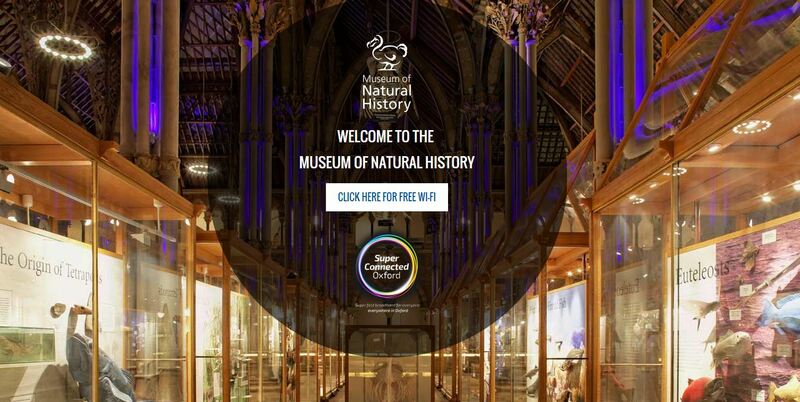 We were able to develop a bespoke sign in page for each of the museums, reiterating the individual museum brands. I project managed the effort – a fantastic though challenging professional experience for me in which I learnt more about buildings than I ever wanted – working very closely with my colleague Anjanesh as the network architect: he designed the network from the ground up, conducting surveys to identify the best locations for the points to provide optimum coverage, negotiating on those locations with the electricians, conservation and building services, designing the wired network and configuring all the access points and switches. There is no way this would all have happened without Anjanesh. There were also lots of unexpected challenges a long the way, but we were fortunate to be surrounded by so many great colleagues who could support us. For example, the mounts for the Wi-Fi access points we purchased just did not fit the points, and despite extensive negotiations with the supplier (who were good) we could not get the mounts we needed. David, the object mount maker at the Ashmolean stepped in and saved the day by designing and making the over 100 mounts that we required, and actually designed them in such a way that they just snap into place (what we called snap and go), actually saving us a significant amount of time during the installation projects. There were lots of other things where colleagues helped us as well, whether it was pushing through a complicated and deadline sensitive procurements, or pouring over a contract late on a Friday afternoon so we could get it signed and the work underway. So many people had a hand in making it all possible. Now that the service is in place we still have a lot of work to do in order to utilise the opportunity to enhance the visitor experience, but after a grueling 8 months on the project we are so pleased to have the service in place and we are looking forward to making the most of it. This entry was posted on March 30, 2015 by Jessica Suess in Uncategorized.